For 2018 our travel trailer lineup includes the well liked Jayco 26 Foot Bunk House. We buy our trailers new at the beginning of each season. 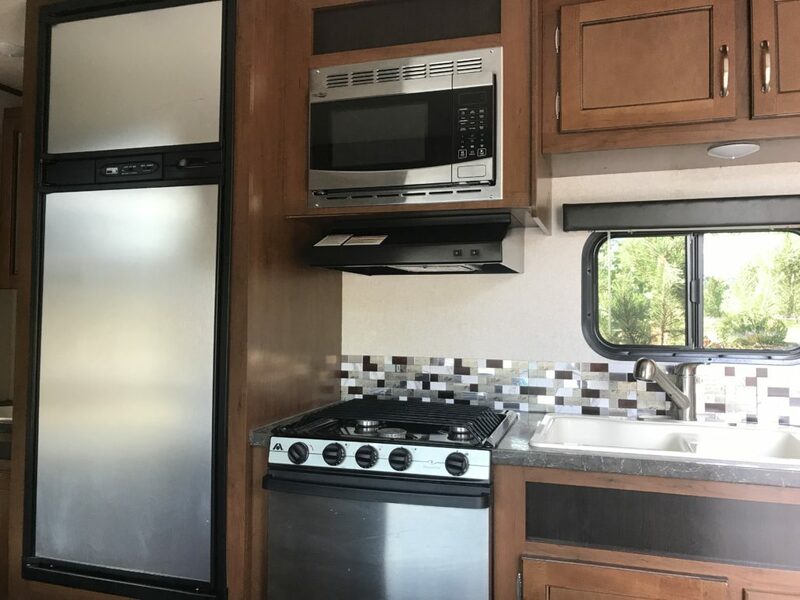 This Travel trailer is ideal for small families looking for a little more space or large families looking to explore the Grand Teton and Yellowstone National Parks. 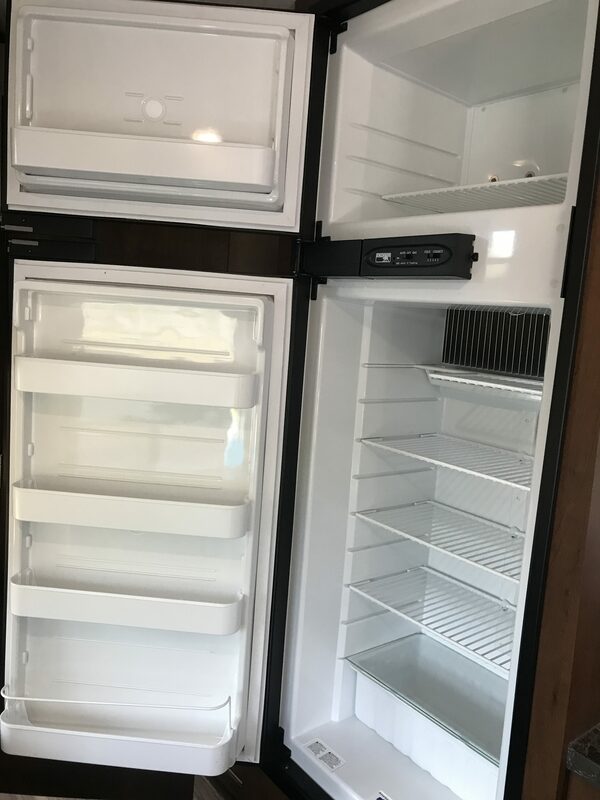 With sleeping arrangements up to 9 guests this unit contains multiple sleeping arrangement options, kitchen with 2 burner range, microwave, oven, and 8 cubic ft fridge/freezer. Powered with two 7 gallon LP tanks and a Battery Bank for off grid access. Exterior features include seamless LED powered awning, and Bluetooth indoor and outdoor speaker systems. A Full hookup site is required to take advantage of the AC system and all accessory option ports. A Travel Trailer or Caravan is a pull behind (towed) unit designed to provide home style amenities and comfort while traveling. Our trailers are purchased new at the beginning of each season to provide our guests with the latest amenities. 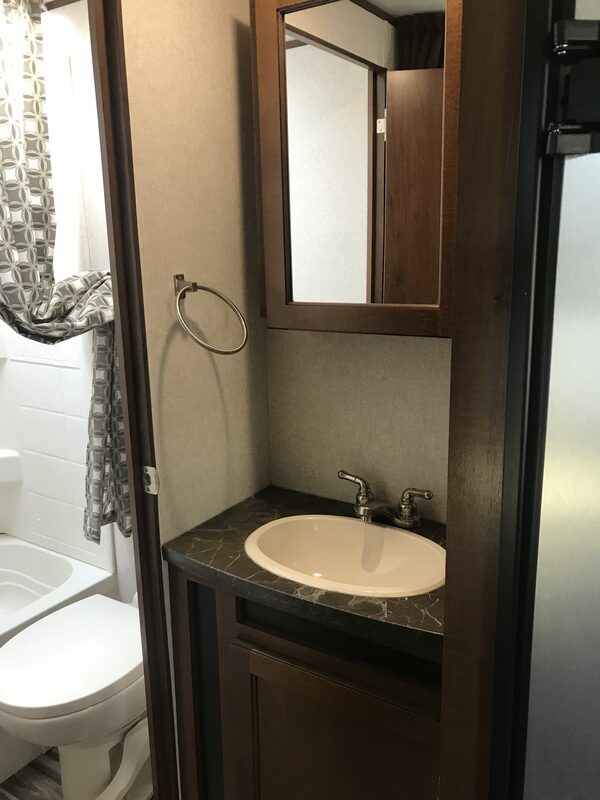 The great option about a travel trailer is that once you setup your trailer in your campsite you can detach your tow vehicle and travel the surrounding areas without the need to tow your trailer around. They differ from RVS in that with an RV you are constantly driving around your campsite. 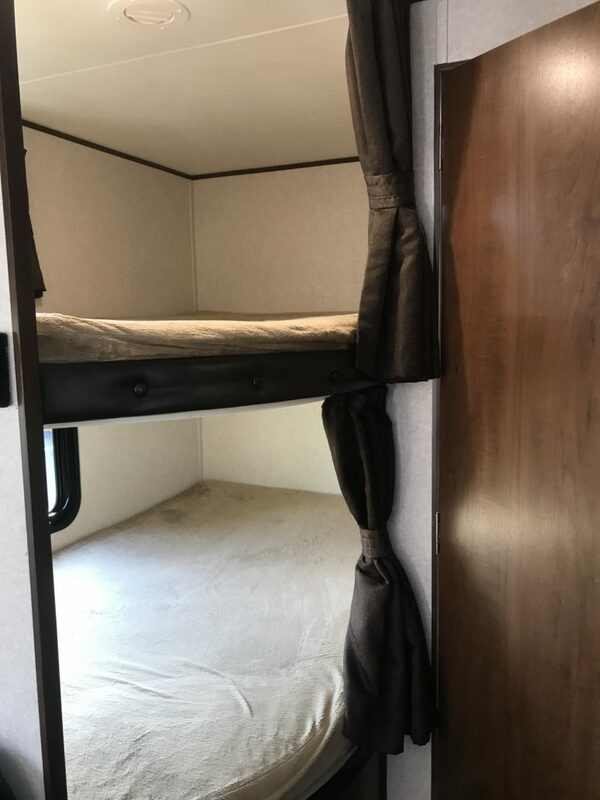 As a note on campsite size restrictions, you can detach your travel trailer from your tow vehicle and park your tow vehicle next to the travel trailer saving close to 14-25ft in space depending on your tow vehicle size. How do I tow the Travel Trailer? You have a number of options available for towing the travel trailer to your preferred camping area. First, you can tow with your own vehicle. For our 26FT travel trailer your vehicle must be able to tow a minimum of 5000lbs. The ball size for this trailer is a 2 5/16″. We have both a 4 way electrical connection and the 7 pin option based on your tow package on your vehicle. Second, if you do not have a vehicle capable of towing we can provide one for you. Our Large SUV (Chevy Suburban) Rental is a great match for the 26ft unit. Where can I take the Travel Trailer? Travel Trailers are a great way to experience both the National Parks and our surrounding National Forests. 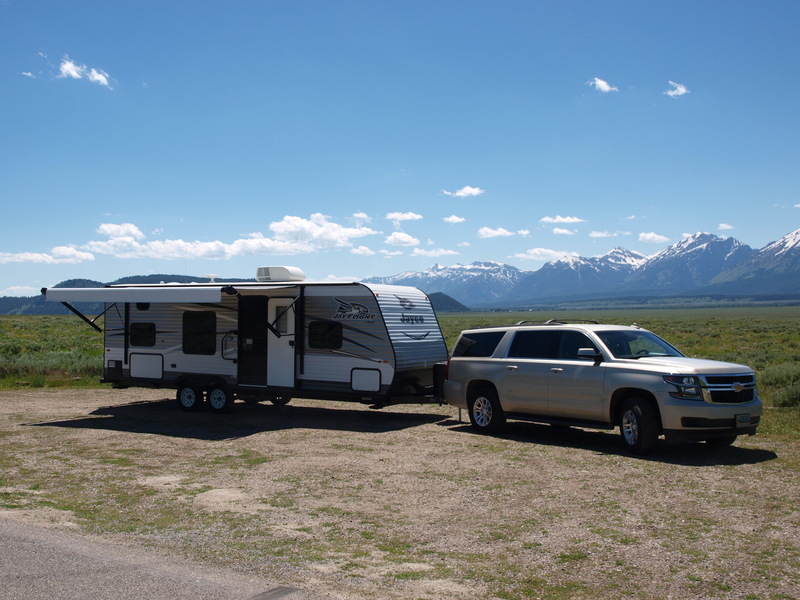 The National Parks (Grand Teton National Park, and Yellowstone) provide campsite specific travel trailer parking on a reservation and first come first served basis. 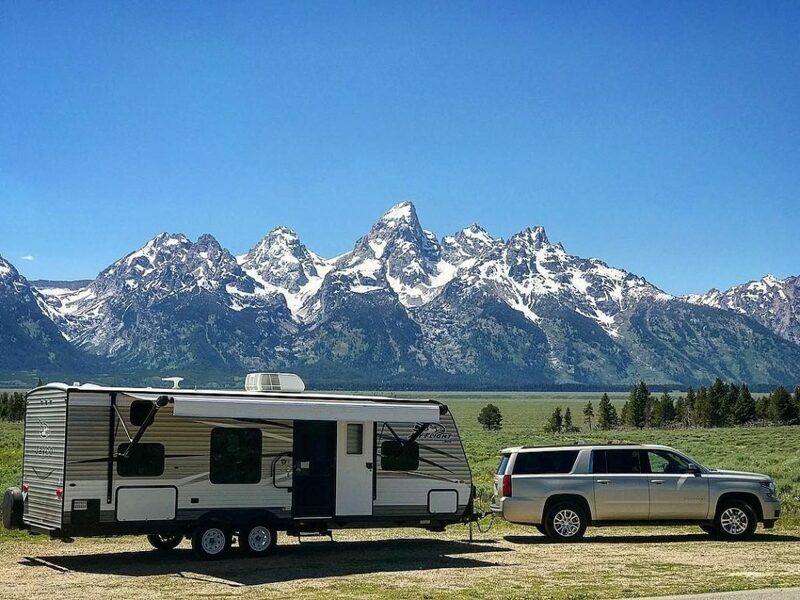 For a complete list of approved camping locations and reservation information for the Grand Teton National park please visit their site here and for Yellowstone please visit their site here. What are the basics about the trailer? Water, Power, Heat/AC? 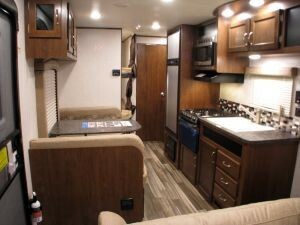 Our 26ft Travel trailer is a great option for larger families. 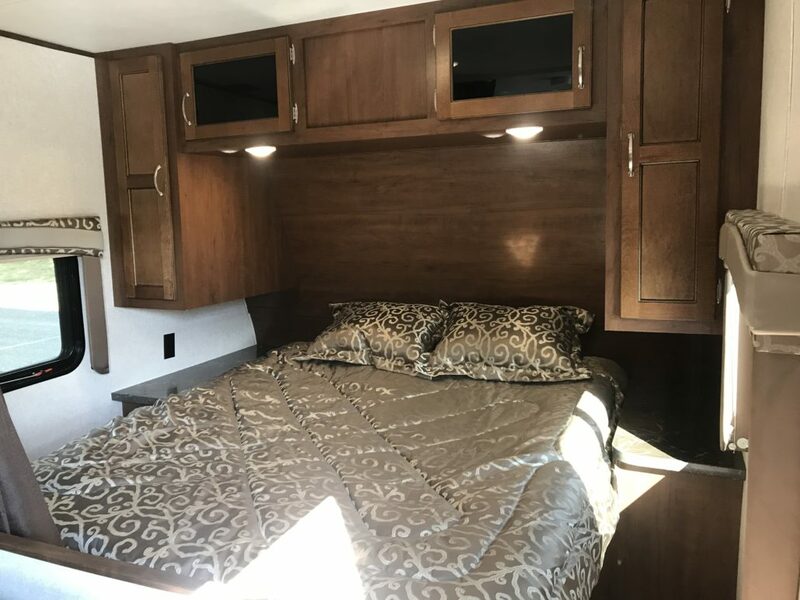 With a Queen size bed , 2 double size bunk style beds, and a dinette and sofa sleeping section this trailer can sleep up to 9 guests. A galley kitchen contains a microwave, small oven, two stove top burners, and a 8-cubic-foot mini fridge. 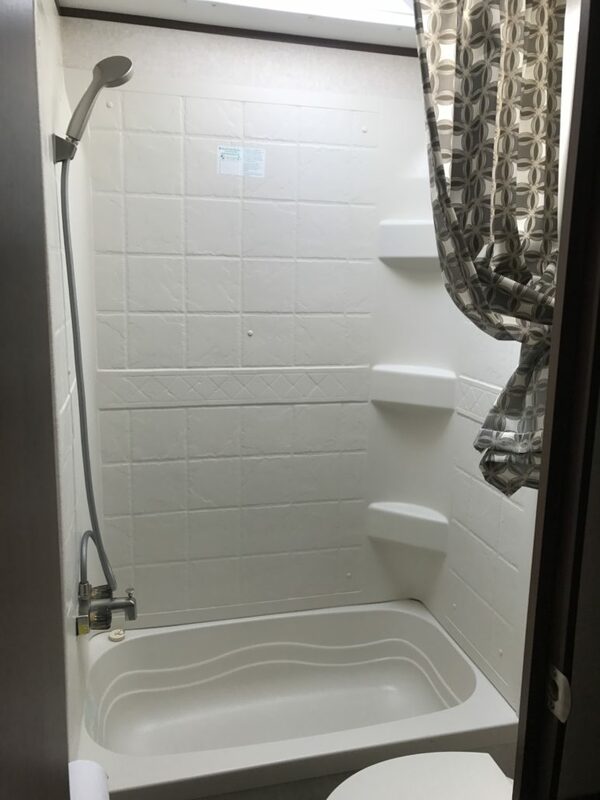 The bathroom contains a toilet and a shower. A full powered LED lit awning as well as an indoor and outdoor Bluetooth radio system makes this trailer a blast to camp in. The fresh water tank holds 42 gallons. Typically with a family and friends and light water use this can last for 3-4 days. With heavy use of the sink and shower it will last roughly 2-3 days. Fresh water can be filled up at most camp sites or RV hookups. A hose is included to refill the freshwater. The tank will leave full from the shop and can be returned empty or full. There is no charge for water refill at the shop when you check back in. The Black water tank is 43 gallons and the Grey water tank is 43 gallons. Black water is your waste water from the toilet and the Grey water tank is water used in both the sink and shower. Both tanks leave empty and will need to be returned empty or there will be a $50 charge to empty the tanks. You can empty these tanks at any RV campground or at our local Shell Gas Station in Jackson. Heat is provided in the trailer by two 7 gallon propane tanks for both heat and hot water. The heat is moved throughout the trailer via an electric fan connected to the batteries. The pilot for the water heater in the 26ft trailer is lit automatically. Two 7 gallon tanks when used lightly can last 15-20 days without a problem. With heavy use expect roughly 10 days of propane. Propane can be filled at any propane shop. The tank will need to be returned full or you will be charged a flat $25 refill fee. To use the AC on the unit you will need to be at a full hookup site designed with a 30amp breaker. The AC system will not work with the generator or just the battery’s. That being said AC is not typically needed in the Jackson Area.